Should I Wait for Lower Interest Rates If Sales Prices Increase? Whether sales price is more important than the interest rate depends on your perspective. All real estate is local. This means whatever is happening in your local market in Phoenix, for example, could vary wildly from, say, the market in Manhattan. It's pretty much impossible to time the real estate market, but you can try to take advantage of the way the market moves. As Bono sings, "She moves in mysterious ways." You can't always predict how the market will move. But you can watch it move. Let's look at historical interest rates for a 30-year fixed-rate mortgage. Generally, the rule of thumb is when interest rates go up, sales prices move down to compensate, but not always. Say you are comparing a home in Phoenix that was worth $240,000 and your interest rate is 4.5 percent. 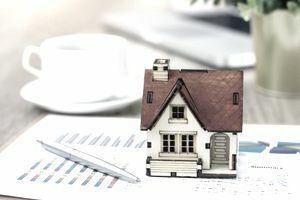 If you were buying in a declining market and waited until that price fell to $210,000 but rates went up to 6.5 percent, you might be better off buying at the higher price. Yes, it is true. A payment on an 80 percent LTV mortgage for a $240,000 home at 4.5 percent is $972.84. A payment on an 80percent LTV mortgage for a $210,000 home at 6.5 percent is $1067.87. Put another way, if you paid $30,000 more for the home by paying $240,000 and lived in that home for 30 years, by the time you paid off your loan, you would have paid a total of $350,222.24. If you paid $30,000 less by paying $210,000 but paid on the higher interest rate for 30 years, by the time you paid off your loan, you would have paid a total of $384,433.20. In this instance, it is not better to pay less in exchange for a higher interest rate. Let's now compare that home at $240,000 if rates went up a half point, and you wanted to keep your payment the same. The amortization of most mortgages is for 30 years. If your down payment is 20 percent of the sales price, how much of the home could you buy to keep your payment around $975? You can see that a 2 percent increase in an interest rate would lose you about $50,000 of purchasing power in this price range. If you doubled the sales price, you would lose about 100,000 of purchasing power for a 2 percent spread in interest. This is why interest rates play a huge factor for many first-time home buyers. If you are stretched too close to the top end of your price point and rates go up, you might not be able to buy that dream home you want because you will no longer qualify for that sales price. And, just so you know, making a lowball offer is not always the answer.